Montell Ernest Owens was born May 4 1984 in Plainville and grew up in Wilmington, Delaware. Montell was fast and muscular. He was an excellent baseball and football player and, later, a track and field star. He was also gifted musically and academically. At Concord High School he lettered in football, baseball and track. He was the star of coach George Kosanovich’s Raiders varsity, scoring 20 touchdowns as a tailback and playing defensive back. Montell was also a member of the National Honor Society and traveled Europe as a jazz trumpeter with American Music Abroad, a summer tour program for high-school age musicians. Montell attended the University of Maine—a school best known for its hockey team—on a football scholarship. He lettered all four seasons, playing primarily as a special teams player and kick returner for the first three. As a senior in 2005 he was the Black Bears’ starting fullback, gaining 779 yards and scoring 9 touchdowns. He had worked hard to refine his running technique with assistant coachJeff Cole and the two had become very close. After Cole died from brain cancer, Montell dedicated himself to becoming the player the coach told him he could be. One of Montell’s teammates freshman year was linebacker Lofa Tatupu, who later transferred to USC and then starred on the NFL. No one imagined at the time that both teenagers would one day be Pro Bowl picks in the pros. The fact is, not a single NFL club was interested in gambling a pick on Montell in the spring of 2006. In fact, he watched the draft with his friend, Kevin McMann. Ironically, McMann was the last player picked—meaning Montell went undrafted. He accepted a tryout invitation from the Jacksonville Jaguars and made the club as a special teams player. It was only then that pro scouts realized what a special player they had overlooked. Montell was an absolute demon covering kicks for the Jaguars. In 2009, he recorded 30 special teams tackles. 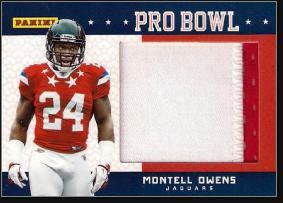 In 2010, Montell made his first Pro Bowl. He recovered a fumble by Devin Hester of the Bears on a kickoff and returned it for a score. Later in the game, Matt Cassell hit Montell with a scoring pass. Montell also played in the Pro Bowl the following season. When injuries ravaged Jacksonville in 2012, he started four games at running back and scored three touchdowns. The Jaguars released Montell after the 2012 season, John Bonamego, the Jags’ special teams coach, was hired by the Lions in the off-season, and he convinced the club to sign Montell as a free agent. He missed most of the season with a knee injury, but returned to the field in 2014. He played three games for the Lions and three more for the Bears.